This is a hypergraphic novel. The French avant-garde group known as the Lettristes invented the term hypergraphie. Hypergraphies make use of numbers, letters, any other symbols, and images. The English translation hypergraphics is less well known than use of the same word to denote hyperlinked text and graphics on a computer, which is a completely different meaning. The original edition, titled Écrit en prose ou L'oeoeoeoeuvre hypergraphique, was published in combination with another of his hypergraphic novels, Pour un avenir meilleur, by Éditions PSI in 1971. Écrit en prose won the Anti-Goncourt Prize the same year. A new edition of Pour un avenir meilleur, in colour, was published in 2010 by Editions AcquAvivA of Paris. With the growing interest in abstract comics and asemic writing (please research these on the www, if you don't know them), now is a perfect time to reintroduce the world to this avant-garde classic. You get to make up the details of this novel for yourself. The author has given you the bones of the story. Your imagination and inventiveness will provide the flesh. "Alain Satié reveals a new facet of himself with this new hypergraphic novel. He works relentlessly, with determination and certitude, to explore the vast landscape offered by hypergraphics, which is surely the most profound route today. 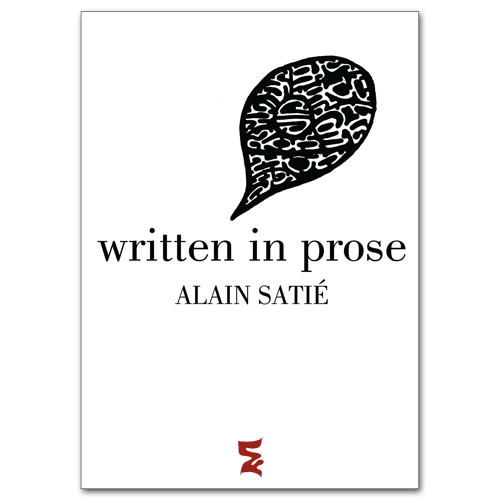 Within the framework of this narrative, Alain Satié seems to reprise his earlier achievements by broadening them and adding nuances. From page to page he fans out a display of possibilities which make this work into a summation, a sort of anthology of his contributions to the chiseling approach. In some places he presents innovative material, in others he employs an unused technique or rhythm, updating a new combination of themes that he has diverted. In this way he juggles invented or borrowed elements which he tortures in a thousand ways to the point of their extreme possibility of annihilation that he has proposed and systematized as a caught and released infinitesimal novel. In the course of reading, these hermetic combinations, always situated at their proper level, shine like so many flashes added to other flashes from different sources; they sprinkle our lives with unassailable better or privileged moments."